In 2002, my husband and I welcomed our baby girl into the world (after about 40 hours of labor!). You just can’t prepare yourself for your first child, no matter how many books you read, or how many other parents you talk to. From the moment our daughter Autumn was born, I knew I was in for a seriously wild ride – she was loud, she was strong and she was perceptive. 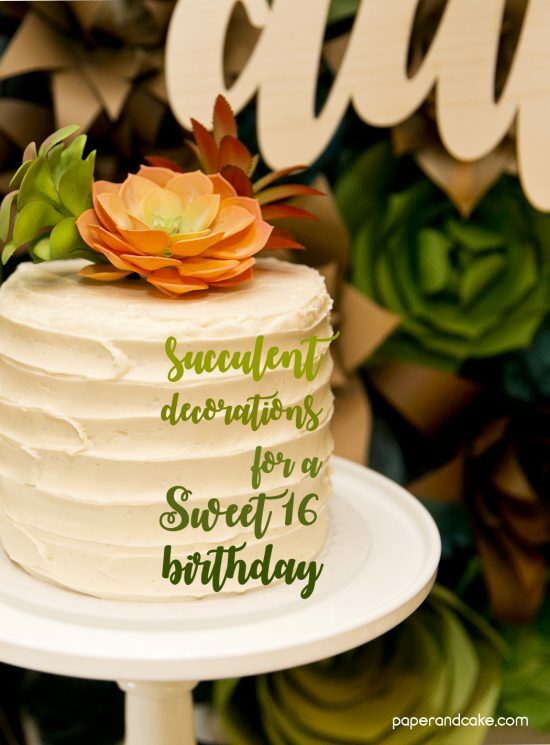 I’d like to share with you her Sweet 16 birthday party details, with this Succulent themed Birthday Party, and maybe even take you on a trip down memory lane (obviously whether you want to or not). For Autumn’s first birthday, I chose to give her a Jungle theme – complete with construction paper decorations and a Giraffe Cake patterned after something I saw in Martha Stewart’s now defunct Kid’s magazine. And I have to tell you, I came THIS close to recreating it for her 16th birthday! 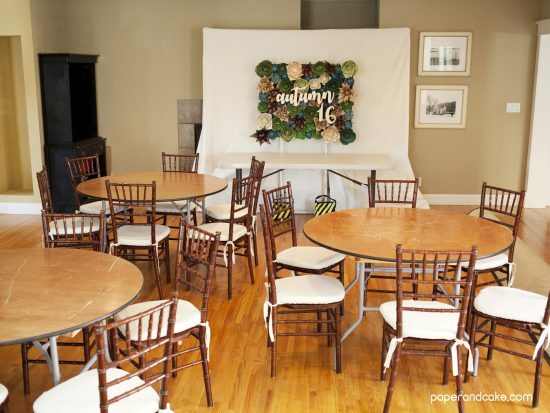 I remember how hard I worked on planning and decorating that party, how absolutely perfect I wanted it to be (side note, it was that party which is the inspiration behind Paper & Cake!). 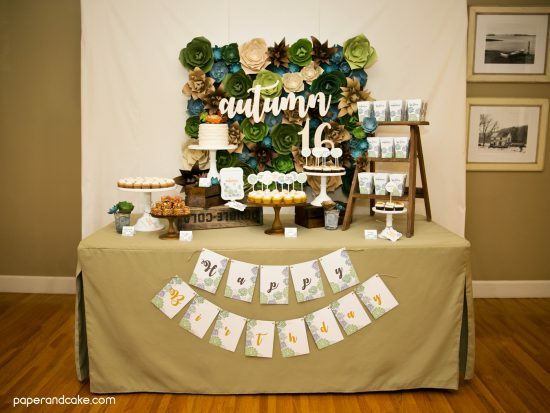 And while we chose a succulent themed Birthday Party instead, there is a little something from her first birthday incorporated into this one – see if you can find it. So lets start with the “venue”… we decided to have her party in our home, and made a guest list comprised of mainly family. And even though there was not a formal sit down dinner, we had a pretty hefty menu planned and wanted people to have comfortable places to eat without having to necessarily balance their plate on their knees. 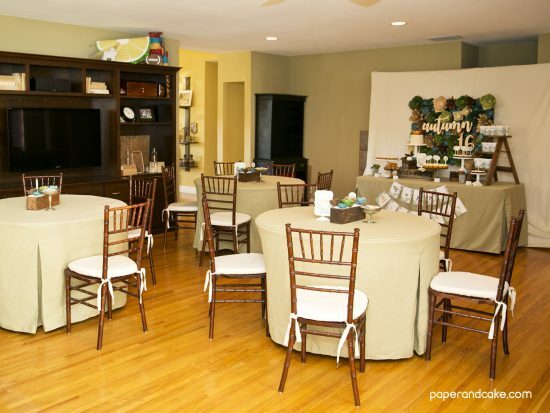 We emptied out our family room of its furniture and rugs, and rented these 48” round tables and pretty chairs. You better believe the plan all along was to incorporate table covers from Tablevogue, and they did not disappoint! I ordered 3 round and 1 rectangular cover in “olive”, and the room was transformed! I am a huge fan of Tablevogue’s products, their covers are gorgeous, well made, and practically bulletproof (okay, “kid proof” might be a better way to describe the indestructible fabric). 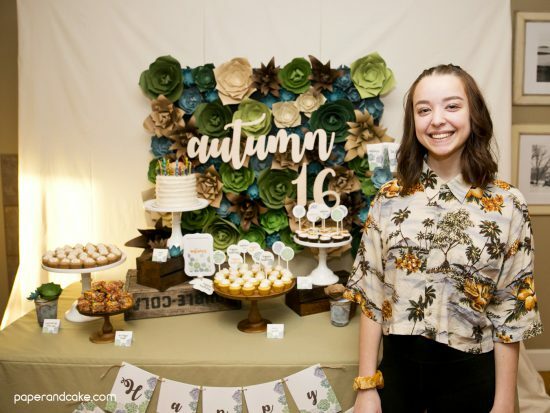 After my daughter and I came up with her party theme, you know I went a little crazy coming up with all the details – but the paper succulent backdrop was the main focal point to which everything else was designed around. The 3D paper succulents are really quite fun to put together, as long as you have an electronic die cut machine, otherwise I may suggest inviting several friends over to work on it together. I’m offering the patterns and instruction for these in my shop, but feel free to look around for some that are pre-made, or even design your own patterns. Sitting just in front of the paper succulents is a laser cutout, in wood, of Autumn’s name and the number 16 from Delovely Details. To achieve the “pop out” effect, the cutout is affixed to 6 inch wooden dowels which are sticking straight out of the foam core backboard. It looks so good! Autumn definitely had an opinion on the desserts for her party. She LOVES my carrot cake and she is obsessed with the macarons from a local bakery (specifically the lavender flavored ones), and she insisted on snickerdoodle cookie cups from our friend Kristin. 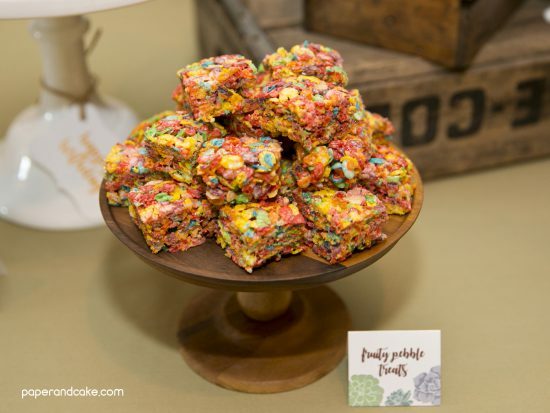 The rest of the items we chose were lemon cupcakes, s’mores cupcakes and fruity pebbles treats. 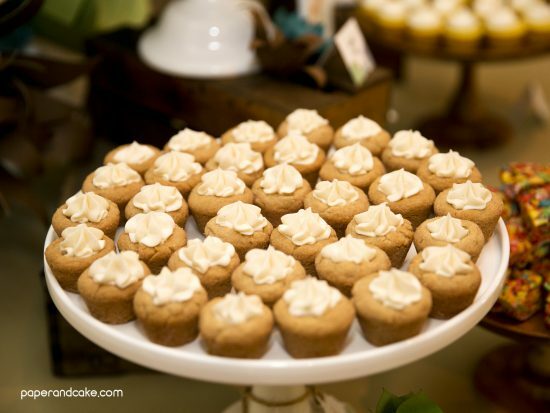 I think we splurged where we needed to on this dessert table – the macarons were not cheap – and the cookie cups were worth every cent. All of those cupcakes were semi-homemade, meaning they started with a box of mix. I made the lemon buttercream frosting for the lemon cupcakes and fancied up the s’mores cupcakes by layering in crushed graham crackers to the bottom of the liner before adding the batter, sticking in a bit of hershey’s chocolate bar to the center of the still hot baked cake, and placing half a marshmallow to the top of the cupcake before putting it in the broiler for a minute or two. SO inexpensive! See more of our teen and tween age appropriate themed parties, including this sparkly Gemstone Party! 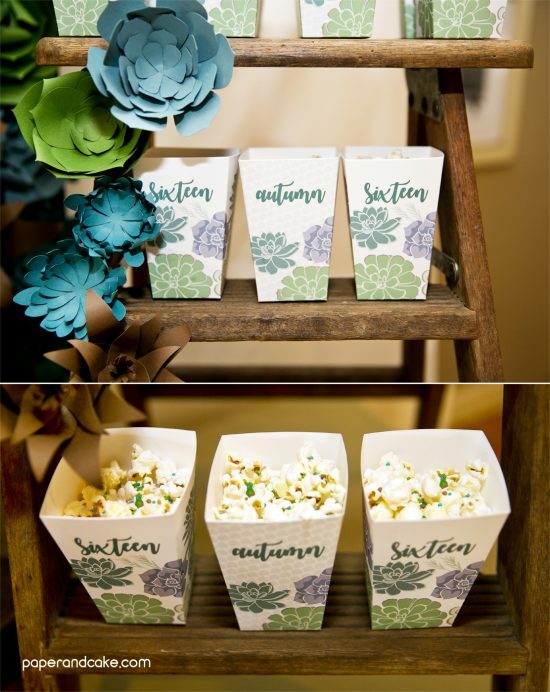 I love adding a little salty and sweet treat to the dessert table, straight up popcorn sprinkled with Candyfetti™ displayed on a crusty old step ladder adorned with – wait for it – mini paper succulents! Now. Lets talk centerpieces. I had a vague idea of what I would like to do for centerpieces, vague. I had these stand frames, I had the vintage wooden cheese crates, a friend called and said there was a sale at Michaels on plastic succulents, and I knew my mom owned three silver compote dishes. And that is the seed from which these centerpieces grew! 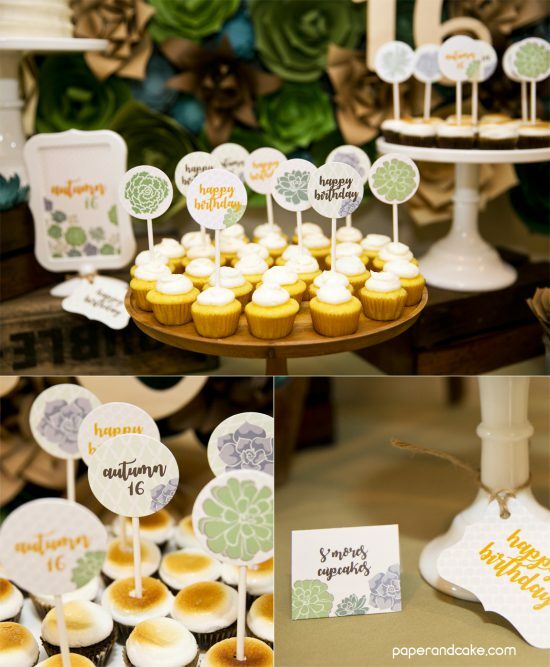 The stand frames called for a cute graphic on one side, and (here it is) a photo from Autumn’s 1st birthday party on the other. The cheese crates were filled with white rock (from that sale at Michaels) to hold more mini paper succulents. The compotes were given a quick wash and filled with Sour Bawlz™ candy from Sweets Indeed. I gave quite a bit of thought to what people might like to do at a 16 year old’s birthday party, where our guests would range in age from 3 to 73. It’s a good thing we were expecting some beautiful weather, because I ordered up some really fun activities from Joymode! 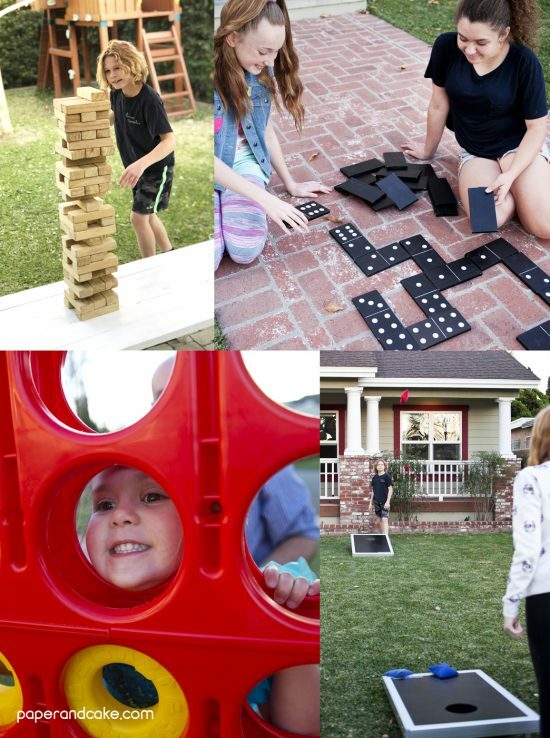 They offer rentals for all kinds of items – including giant Jenga, giant Dominoes, Corn Hole and giant Connect Four. This was one seriously spectacular party! I’m tearing up just thinking about it now. Autumn is an amazing person, she always has been, and I just love who she has become. Now, for the details! We have this set all ready for you in our shop. You can purchase a printable kit with editable items today, or have a few things shipped in for your next event. 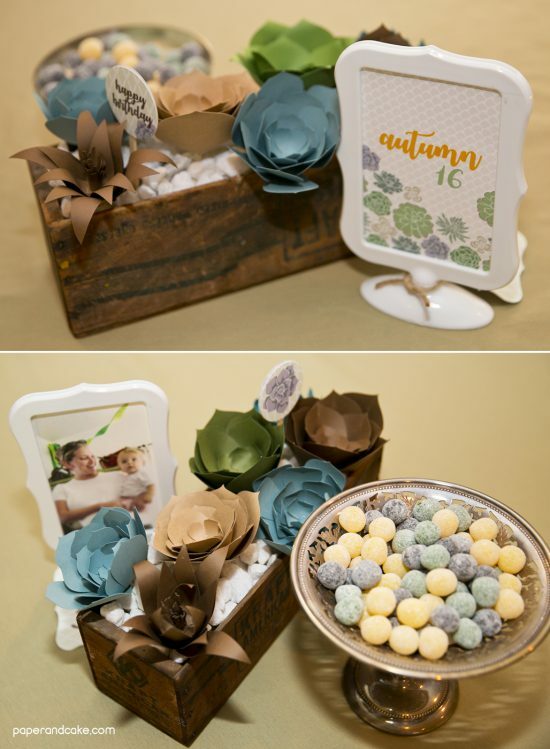 Our paper succulents backdrop is not included in this kit. We have options for you! 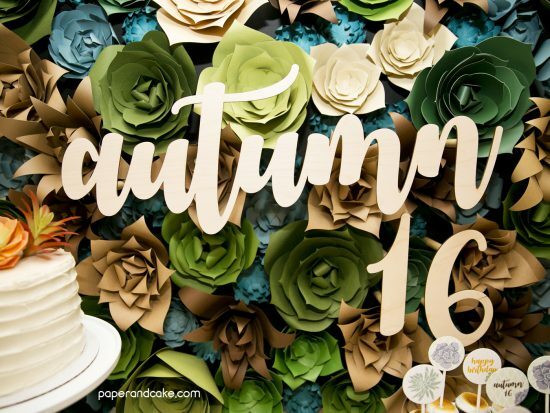 You can purchase DIY kit to make your own paper flowers, or this digital file to have party graphics printed at your favorite print shop.